This epistletory novel tells the history of the remote kingdom of Montagne from multiple points of view. Fortitude, better known as Trudy, has a secret and little understood ability to sense the future. She's grown up in a tiny remote village of Bacio, and is madly in love with Tips, the youngest son of a struggling miller's family. Tips has gone off to join the military so that he can save up enough money to get married. In the meantime, soft-pated Princess Wisdom, nicknamed Dizzy, is in the midst of marriage negotiations with the prince of a neighboring kingdom. I liked Trudy enormously, and and was really intrigued by her magical power. Dizzy annoyed me instantly. I had hoped that Dizzy would eventually come into her own, and stop being such a brainless idiot, but sadly, that never happened. I was rooting for Trudy and Tips to sort everything out. I was shocked when it was revealed that Tips had been lying to Trudy the entire time, and was working for a traveling circus instead of soldiering. I was even more surprised when it turns out that Dizzy has a natural skill as an acrobat and she runs off with Tips!!! So disappointing. 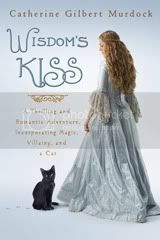 Wisdom's Kiss has been compared to The Princess Bride, and I can see why. They aren't entirely dissimilar, especially those portions that are written as if from a history book in the far future. There's a deliberately grand and pompous tone to Wisdom's Kiss that I did find rather fun. I was distracted by references to other European countries, though. I know my European geography enough that all I could think about was where is Montagne supposed to be? Is it Monaco? Someplace that is now Belgium? I almost wished that the book had taken place in a completely alternate world. It was hinted that the naming convention of using virtues for women's names might be something that only happened in royal families, and that Trudy (a.k.a. Fortitude) would be revealed to be related to Dizzy and her grandmother Ben. Instead it turns out that Trudy's mother happens to be from the same capital city. Big whoop. The other "big reveal" at the end, is that Tips' mentor Sir Felis el Gato is known by the nickname of "Puss in Boots." What??? Is this supposed to be a novel-length re-telling of Puss in Boots? I have to say, despite the purportedly magical cat, royal families and unlikely romantic match-ups, I still didn't see that connection at all. A nice story for most fantasy readers, I suspect that this book would have appealed to me more had I read the companion novel, Princess Ben. Despite it's lack of polish, the political intrigue, plot twists, faint hints of romance and Renaissance-like magical setting make for a nice addition to most fantasy collections. I certainly haven't heard of this one before... and I haven't read Princess Bride before so I can't relate. Reading your review made me very unenthusiastic about the book despite it being fantasy. But, I think I would check this out. It wasn't a bad book! I just disliked Dizzy so much, it really hampered my enjoyment of the story. I was SO disappointed with the Tips and Dizzy pairing. Trudy was shafted. I also didn't get the Puss and Boots connection at all, but I don't know the original story that much. To me it just sort of came out of the blue in the end.